Sometimes, a company within the iGaming industry makes it very clear what its priorities are from its name, and Spin Games is certainly one such company. Unsurprisingly, the focus here is on slot games, and although the Spin Games portfolio is limited compared to the big names in the industry, the company has been getting some attention as of late. Based in Reno, Nevada, just a short hop away from the gambling Mecca of Las Vegas, this small company, which has under 50 employees at this point, is beginning to expand its attention across the world, and the games they have to offer suggest they are more than capable of succeeding in this mission. The company is well known in Nevada for supporting local charities and community projects, which has given Spin games a strong reputation outside of the industry as well as within it. Spin Games offers a remote gaming server (RGS) called ROC, which means Spin Games can provide operators with personalised site framework which offers the ability to choose gaming content as well as providing comprehensive security and data. This RGS is mobile compatible too, meaning that players on all devices can play games using the server. Although the focus is on slots, there are over 10 classic table and card games, mainly consisting of variations of poker, while the company also offers Keno. In the modern iGaming industry, it is important to offer options, and although the name may suggest otherwise, Spin Games certainly does, which should help them find further success in the future. However, that being said, it is within the collection of slots on offer from this software developer that the real impact is made. There are over 30 slots to choose from here, and they are available at a surprising number of online casinos including bet365 Vegas, GoWin Casino, mRiches, Pocket Vegas, Pyramid’s Fortune, Slots Devil, and Touch Mobile Casino. As the number of mobile focused sites on this list suggests, the mobile friendly nature of the slots that Spin Games offers makes up a large amount of its popularity in the market, especially as Spin Games’ mobile games are playable in your mobile browser without the need for downloads. Women hold a strong role in Spin Games titles, which is refreshing as this happens depressingly rarely. Mainly the women involved are Queens, from Queen of the Skies, to Phoenix Queen and Royal Queen. Classic themes like Egyptian, Greek, and Asian mythology are represented in slots like Egyptian Gods Shadows of Olympus, and Gods of Fortune respectively, while American concepts are abundant in titles including American Gold Rush and Rhinestone Cowboy. The games all follow fairly well trod paths at this point, in terms of gameplay as well as concept, but there is definite potential here, and the company is developing at a rapid rate, so we can assume this potential will be realised sooner rather than later, which will be fun to watch, and to play! T&C's: The Welcome Bonus is based on a New Player’s first and second approved deposit at the casino provided that he meets the conditions for the bonuses. 2. To be eligible for the bonuses, you must deposit a minimum of €20 and your account status must not be blocked from receiving bonuses. 3. Players are eligible for one (1) first deposit bonus per person / family / household / computer / address / IP / e-mail address, and environments where computers are shared (university, fraternity, school, public library, workplace, etc). 4. Please note that in the interest of fair gaming, you must wager a minimum of 30x times, the sum of your deposit plus your bonus before withdrawing any amount higher than your initial deposit. Players from Greece X80. 40x times for Denmark, Finland, Norway and Sweden. 5. Bets placed on all games other than slot machines will be deemed a violation of the terms and conditions, your bonus and winnings will be voided. 200% UP TO£800*T&C's Apply.18+ Only.New Players Only.BeGambleAware. 250% UP TO£1500*T&C's Apply.18+ Only.New Players Only.BeGambleAware. Launched in 2017 and with a huge list of big name developers under its name, Gale & Martin has a huge selection of classic and new release slots, poker, roulette, live casino and mobile games for everyone to enjoy. 24 hour support. T&C's: The Welcome Bonus is based on a New Player’s first and second approved deposit providing he meets all conditions for the bonuses. To qualify for the bonuses, a deposit of €20 minimum is required and your account not be blocked from receiving bonuses. The Welcome Bonuses are subject to a minimum wager of 30 (Thirty) times the sum of your deposit plus your bonus before withdrawing any amount higher than your initial deposit. Bets placed on all games other than slot machines will be deemed a violation of the Terms and Conditions therefore your bonus and winnings will be voided. The Welcome Bonuses may be limited to a maximum cash-out, therefore Gale&Martin reserves the right to allow a maximum cash-out of 10x your deposit amount. 250% UP TO£2000*T&C's Apply.18+ Only.New Players Only.BeGambleAware. T&C's: First 3 deposits only, Min deposit £10, Max Bonus £500 and 100 spins on Cleopatra, Selected Slot games only, 30x wagering (dep + bonus) 5x conversion, See full T&C’s. New for 2017, Plush Casino is a NEKTAN online and mobile casino. Packed with over 300 games with software from NEKTAN, NetEnt, IGT and NextGen, there's a good variety on offer for everyone. Boku deposit method accepted here. T&C's: 18+ only, T&C's Apply, Please Gamble Responsibly. Powered by Nektan, the Sun Play offers games from some big names in the industry including NetEnt, NextGen, WMS and Blueprint to name a few. Plenty of choice when it comes to slots and casino games and lots of payment methods available too. T&C's: First 3 deposits only. 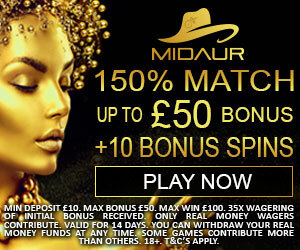 Min dep £10, Max overall bonus £500 & 100 spins on Starburst. Selected slot games only. 40x wagering (dep + bonus), 4x Conversion. Full T&Cs apply. See full T&Cs. T&C's: *New UK customers only, First deposit only, Min deposit £10, T&C’s apply.